Cape Point Route was delighted to be part at the launch of the My Green Card at Boulders Beach Lodge in Simon’s Town today. The card costs R80 for Cape Town residents and allows 12 free entries into any of the Table Mountain National Park pay-points! Here’s the official press release and information! Table Mountain National Park (TMNP) today launched its latest limited entry access card – My Green Card – which was produced in association with Hi-Tec. The card, available exclusively to Cape Town residents, provides twelve free entries into any of the TMNP pay-points– Cape of Good Hope (Cape Point), Boulders Penguin Colony, Oudekraal, Silvermine and the braai/picnic areas at Tokai, Newlands and Perdekloof. The cost of the card – R80 – is linked to the cost of one adult entry into Cape Point. It will increase to R85 on 1 November 2011, in-line with South African National Parks annual tariff increases. What sets My Green Card apart from previous TMNP local access cards is that card production and administration costs have been significantly reduced, ensuring that the bulk of the purchase price goes directly into conservation efforts. Also unlike its predecessors, My Green Card will be easier to obtain in a variety of places throughout the Cape Town Metropole via TMNP offices immediately and Cape Town Tourism Visitor Information Centres from September this year. My Green Card holders are also eligible for a 20% discount off Table Mountain Cableway tickets and 20% off their new Cable Card, which allows the holder free cable car trips for a year. When purchasing TMNP’s My Green Card, a South African ID, 2 ID photographs and proof of residence is required. 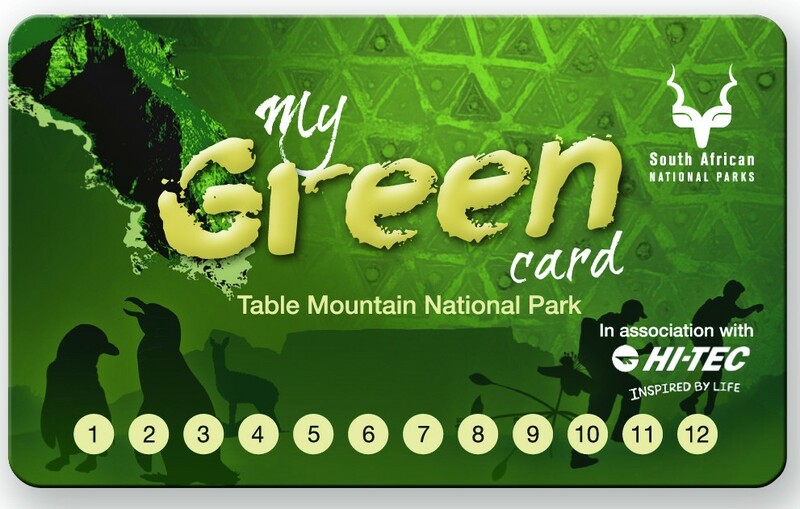 For further information on TMNP’s My Green Card, please call +27 (0)21 701 8692, email tablemountain@sanparks.org or visit www.sanparks.org. This entry was posted in Uncategorized and tagged Boulders Penguin Colony, Cape of Good Hope, Cape Point, My Green Card, Table Mountain National Park. Bookmark the permalink.